Lumineers are a great solution for stained, chipped or misaligned teeth. Lumineers transform your entire appearance painlessly. Lumineers are extremely thin (about as thick as a contact lens) and are applied seamlessly over your teeth to deliver a natural looking smile. Lumineers vs Veneers- there’s really no competition. Lumineers are ultra-thin (approximately 0.2 mm) and highly translucent, allowing them to replicate the natural appearance of your tooth enamel. While traditional dental veneers are much thicker, requiring the grinding down of your original tooth structure, Lumineers are so thin that little to no tooth reduction is necessary. Additionally, Lumineers are durable, and will resist wear and remain resilient to last over 20 years. Stained teeth. 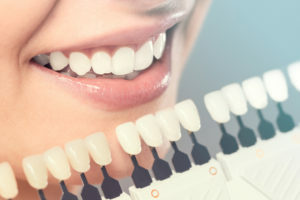 Teeth whitening can’t resolve all stained teeth issues, especially if you’ve had stained teeth all your life, or your teeth are stained because of medication. Lumineers can permanently brighten your smile. Chipped teeth. Lumineers are a painless and attractive way to repair that chipped tooth. Gaps and spaces. In just two visits, Lumineers can eliminate the gaps between your teeth. Reshape small or misshapen teeth. Ultra-thin Lumineers are simply placed over the existing tooth, with no grinding down or removal of the tooth with less tooth removal than traditional veneers. All it takes is two visits to achieve your new smile. At your first visit, Dr. Eastburn will take an impression of your upper and lower teeth, and then send the mold to the Lumineers laboratory, along with photos. Unlike traditional veneers, there is minimal preparation of teeth..
On your second visit, typically a couple weeks later, Dr. Eastburn will place your Lumineers, and ensure a good fit before they are bonded in place. In most cases, dental insurance does not cover the cost of Lumineers, since they are for cosmetic reasons, but financing is available to help you afford the cost of your new smile. Call the Eastburn Dental office at 251-344-2126 to schedule a Lumineers consultation.